If you’ve never seen the Worldomters clock ticking, it’s worth a click. 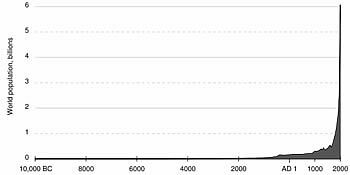 Watching those numbers spin by brings home how very fast the human species is multiplying, especially when you consider the following chart, which shows how recent this population explosion really is. No wonder we’ve got a sustainability problem! Population control has gotten a bad name in recent years, and justifiably so. It cannot and should not be imposed upon women by force, as it has too often in the past. But study after study has shown that when women are educated and respected in society, birth rates go down. Want to slow down that worldometer population clock? Start by educating girls and opening up career opportunities for them after graduation. Educate a girl and save the planet? Might not be hyperbole after all. Climate Change Blues: The one thing the 100% of us have in common is that we can’t afford to ignore the weather!